Raffles Jakarta is a luxury hotel located in the Ciputra World 1, approximately 40 minutes away from the Soekarno-Hatta Jakarta International Airport. Offering the finest in luxurious accommodations and attentive butler service, the hotel boasts 173 rooms & suites, Raffles Spa, ample event space and the finest restaurants and bars. The entrance and lobby decoration are inspired by Hendra Gunawans paintings and the impressive hanging crystal chandeliers designed by Swarovski. A refined buffet of brunch classic and signature Arts Café entrees. Expect a virtual tableau of art and cuisine, where the palette of sights, sounds, textures and aromas from open kitchens create a delightful sensory experience. Enjoy our bespoke tea and coffee blends with a treasure trove of pastries and savouries and signature cocktails with elegant tapas for your evenings. Located between the lush tropical Hendra Gunawan garden, enjoy a light meal at Navina Pool bar. Relax by the poolside in the afternoon sun and cool off with refreshing juices, cocktails and tapas. The experience at Raffles was amazing!! I really loved the hotel. It was so beautiful, big and colourful. Raffles is the best hotel in Jakarta. Staying in Raffles Jakarta has been fantastic. I have advised all my collegues from Australia to stay at the Raffles. Most of my friends have said to me they have never stayed in a better hotel including the service and polite staff. Superb. Will definitely come back again! I stay at Raffles every few weeks and it is always a pleasure, never a chore. The staff and recognition are amazing, the facilities second to none, food is tremendous and the ambiance and atmosphere of the bar is totally enjoyable. We often conduct business meetings in the Writers Bar library, Artists Bar private room, and many a power breakfast has been held there. I wish I had to stay more than a single night and can't wait for the next time to come back. 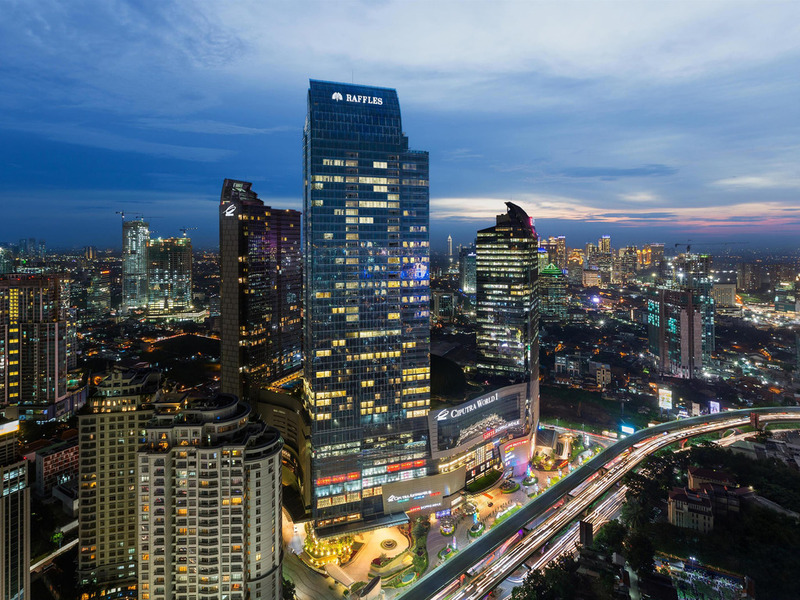 I was invited to come to Jakarta ( for the first time ) for business, and was very pleased to hear I would stay at the Raffles, which I have heard about in very positive terms. But the experience was even better than the very high expectation I had before arriving. I will make sure to stay a bit longer next time in order to be able to use the many attractive facilities that I could only see on my way to different meetings. Excellent CBD location, direct access to Ciputra artpreneur theater & Lotte shopping avenue. Excellent staff all round, very helpful, polite and kind. Excellent all round cleanliness & complete amenities. We booked for one night during our daughter performance event at Ciputra artpreneur and to our surprise.....she was pampered by the hotel butler with flowers, welcome drinks, kids goodies bags, special cup cake and cards all with personalize writing for her performance event. Our kids enjoyed so much this hotel especially the kids club area and a lovely morning stroll along the poolside on 11th floor (albeit the wind is rather strong). Breakfast selection are superior with selection and taste, and thumbs up for ambiance. There's a weird, rather strong, a/c fan noise vibrating at the breakfast cafe (hopefully they rectify it). I'm strongly recommend this 5 star hotel, cheers. This is the only hotel with premium check in for every customer, the customer service's staffs are extremely friendly. Every room is a suite room, extremely clean with perfect amenities. Our family already stayed twice in this hotel, and in both stays they are always happy with the room and services inclusive the extensive buffet breakfast menu. Check in was seamless as I was led to my room for the process. However, I was a little disappointed at the fruit selection presented in my room as I have previously indicated I don't eat apples (I've stayed at Raffles Jakarta multiple times and I was always given other fruits, but this time I was given only apples) - I did appreciate my butler changing my fruit basket and also sending me freshly cut papaya every evening. Spa service was alright, but I enjoyed the gym a lot. Everything was good specially service in Breakfast, very nice singer in the wine lounge. it was a very good service to checking in at room to avoid too timely in the lobby as the traveler should be very tired. As described above, the overall experience was extremely satisfying and the staff were really attentive. Thank you for the great experience. Staff has customer experiences mindset. Feel impress since check-in until check-out. Excellent services. high level in-room service, comfortable rooms, etc. It is a great expireance I stayed in the hotel for second time and found it to be maintaining its standard. excellent service at reception and breakfast. clean room and well maintained.